You see homes like this in Christmas postcards especially with the snow around it. But there is of course a real house that looks like a Christmas house. Just like the house that we will feature today. 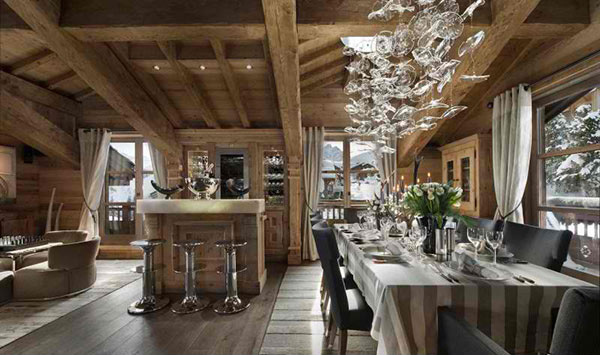 The Chalet Pearl is an elegant ski lodge in Courchevel located in the commune of Saint-Bon-Tarentaise in the French Alps. It has walls made from rough, carved wood, heavy ceiling beams, and snow-peaked landscape. It is a place like this where you will feel like building a snow man 24/7! 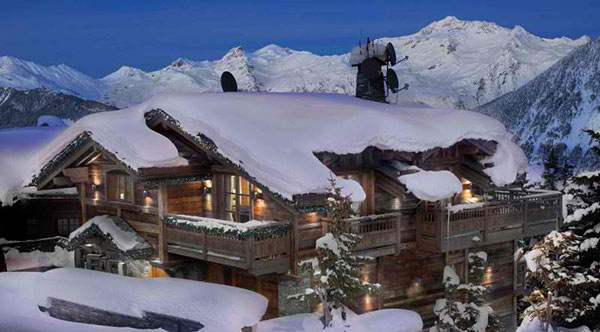 Chalet Pearl doesn’t just have a lovely design for the exterior but it is also a combination of fantastic location and jaw-dropping views. It was renovated for around €1,000,000 cost. 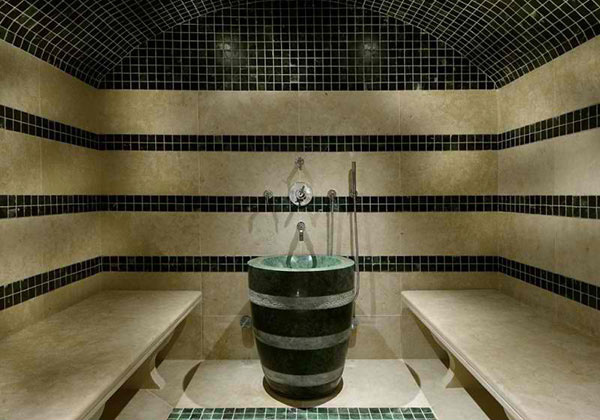 It is 800 square meters (8,600 square feet) in area and is situated in the middle of the Nogentil area, in Belle Cote. 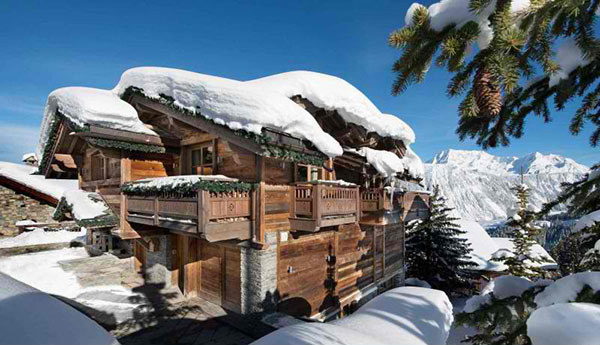 Above the center of Courchevel, it’s within easy reach of the action, but it also has far-reaching vistas across the Dent du Villard and is only 50m (165ft) from the piste. 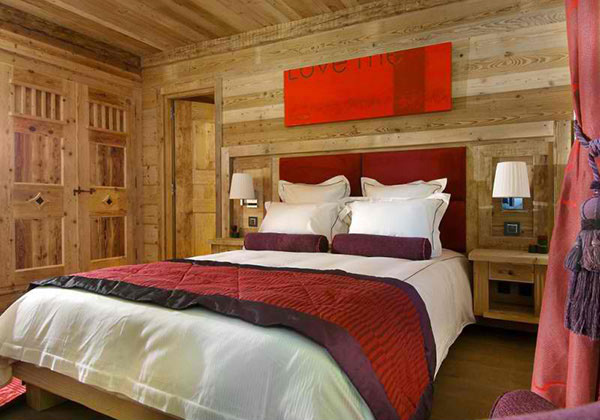 The interior of the house is also cozy with different bedrooms in it. 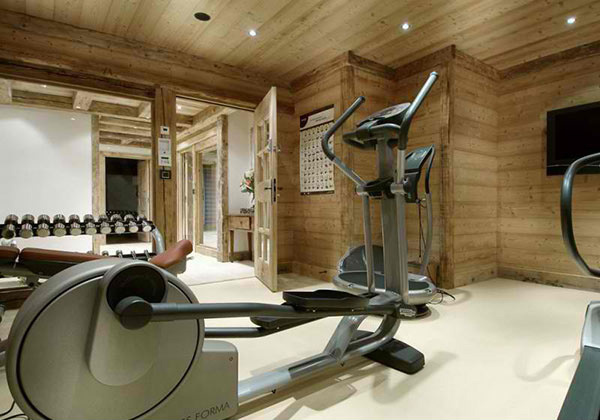 It even has its own home gym and sauna. Covered with snow, you could picture this house as a perfect framed image not just for postcards for even for the walls. And it even looks more dramatic when lighted giving more life its wood and stones. The living room has a cathedral ceiling that adds more space to the interior. It is very gorgeous with wood as the primary material. The look of the dining area plus the bar is very inviting. It looks like you are always on holiday as a very special guest in the house! 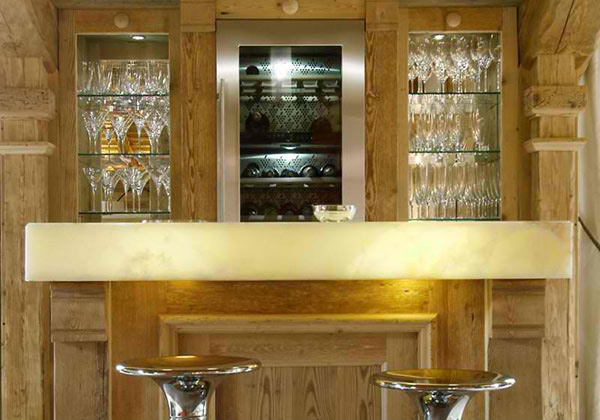 The home bar is this small but it is also designed beautifully with lights and all. 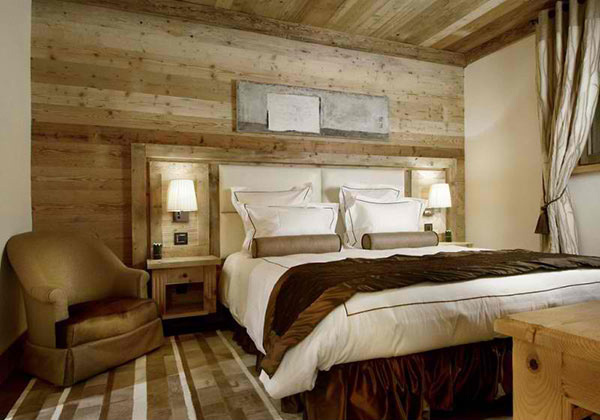 One bedroom in the chalet with earth tones used in it. Wood is also utilized in it. 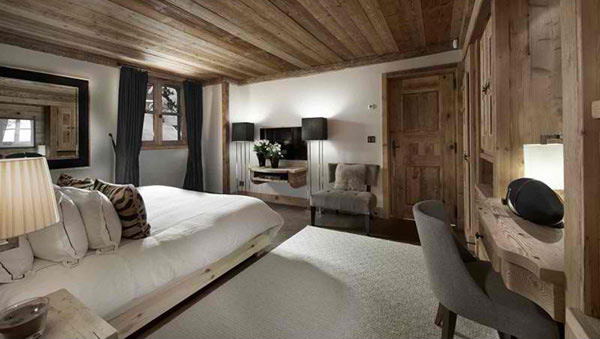 Another bedroom with a sophisticated design. We love the upholstered headboard and the lounge area! 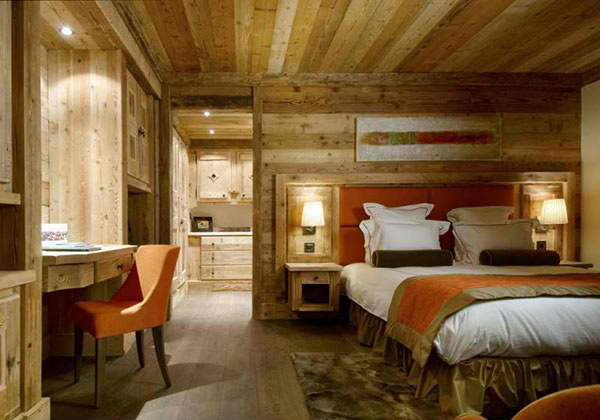 Orange is the accent color of this bedroom which looked perfect with the wood in it. We like the wall decor for this one. You can see a combination of red and purple here. If you think a house like this doesn’t have any entertainment, you are wrong. 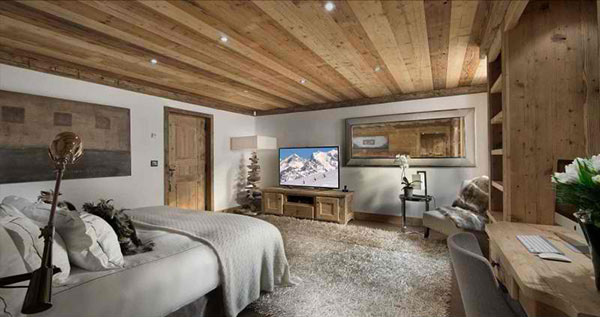 Even the bedroom has a television too! Like the previous one, it also has a built-in vanity on one side and some stunning floor lamps. 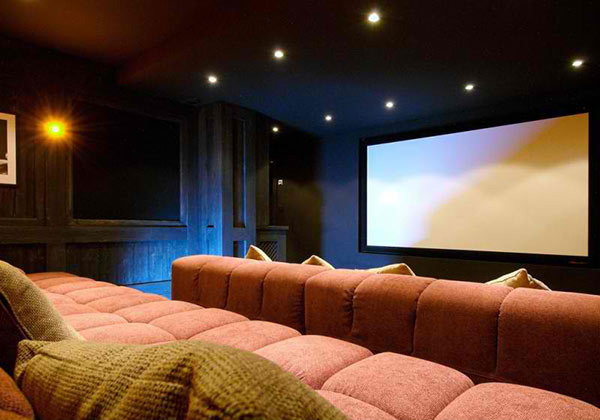 Once you get bored, you can always enjoy your time watching movies in this home theater! 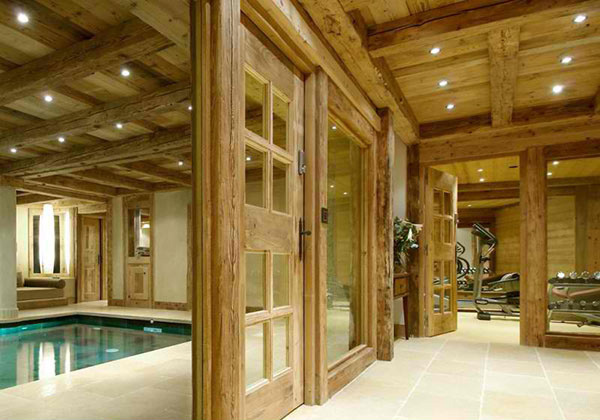 This area is for the indoor pool and the gym. What more would you ask for? This is the home gym complete with everything you need for exercising. 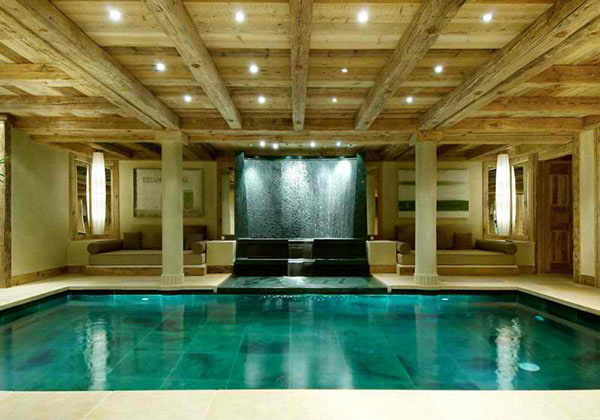 A waterfalls from seems to start at the ceiling goes right into the indoor pool. Lovely! And if you feel cold, you can always get in here for the sauna. 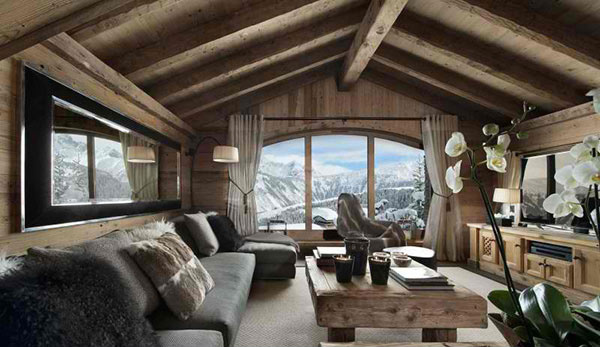 This ski lodge really is the perfect place to rest and unwind. And you don’t have to go far because the Chalet Pearl has it all from endless movie time to endless swimming time! For sure, guests who came to the place were pleased of what they could do in the house aside from the comfort they can get from its public and private areas. This house shows us that even with a traditional design using wood, it can still get that modern touch in it and provide function and beauty all at once! Barn Guest House: Once a Horse Barn, Now a Stunning Modern Home!